I have never found it harder to have the Christmas spirit than I have as a mother. Ironically, I have never so desperately wanted that feeling in my home as I have as a mother. Christmas time as a mom is just different than it was as a child. You have so many details you are trying to attend to that it can be hard to find time to recognize what you feel. That is why I do all I can to have as much ready for Christmas as I can before December hits. I have a great idea for this year, though! If you are looking for a way to bring the Christmas spirit into your home this season, I think you will love this idea, too! It is called #LIGHTtheWORLD. The idea is that Jesus Christ lit the world. He said that He is the light of the world. He also said that we are the light of this world. 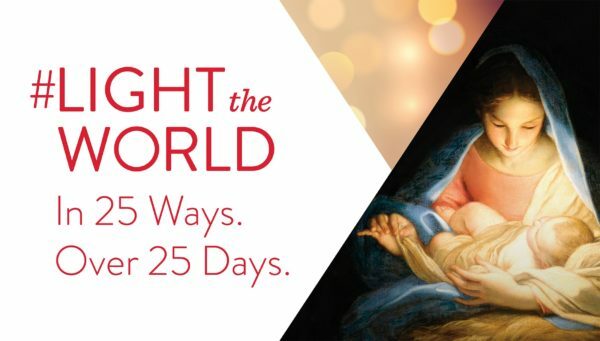 This Christmas initiative has 25 ways to light the world in 25 ways. Each day of December, there is a different theme for the day based on the life of Christ. There is a list of ideas for you to fulfill that theme, or you can come up with your own! Today is December first, so the first day. The theme today is “Jesus lifted others’ burdens, and so can you.” So today you would think of a way you can lift a burden. Do you have a neighbor who needs help shoveling a sidewalk? A friend who could use an hour off from her kids? A neighbor in need of a meal or some other treat? There are so many ways to serve. You can find the full list for the month here. Watch Instagram for our updates on what we do each day. I am excited to see how this impacts our Christmas this year. There are SO MANY resources for you on the Internet. I will be using the ones found here. If you Google “#lighttheworld printout,” you will find many more ideas. Here is to a brighter Christmas!